As the quickest trawl of the farming press or the internet will show you, alternative energy, particularly solar, is now big business. In our practice, new proposals arrive weekly. There is a huge demand for larger scale solar farms, or solar parks, from 1MW upwards, and rents at the end of last year were running at between £650 and £1000 an acre, which compares well with “agricultural income”. Broadly speaking it takes 6 acres to generate a megawatt and so the industry is looking for sites of at least 12 acres. 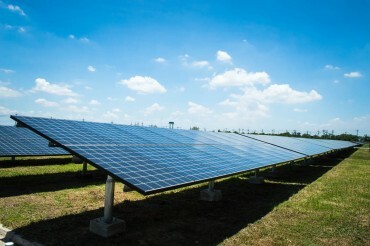 At its simplest, solar farms convert daylight into electricity. The output is then conditioned to match the utility supply and connected to the grid. Solar panels convert light to DC electricity (just like the cells in a calculator). The electricity is cabled to converters which covert DC power to AC, synchronised to the grid. There are no adverse environmental aspects to this process and so the focus tends to be on the visual impact of the array of solar modules. Some sites will not be suitable. Sites in areas of outstanding natural beauty (locally, for example, the Stour Valley) or those of special scientific interest (locally, for example coastal pasture) are avoided. Sites to which there is nearby public access in the shape of footpaths or bridleways fall into the same category. As you may expect, Grade 1 land is not favoured, nor will it be a surprise to hear that land shaded by woods or buildings will not be sought after! What the energy companies will look for is either flat or south sloping land. Ideally there will be power lines (11KV or 33 KV) close at hand (the closer the better). They will not want land that is rocky, is overlooked, and will prefer free-draining land. Lastly, and not least, the land needs to be available for at least 20 years. Competition for local planning authority approval can be quite intense and we have found that energy companies need to have to move rapidly. Last year, the Department for Communities and Local Government (DCLG) issued planning guidance the general thrust of which was to give local authorities greater say over the siting of solar farms. Needed though “green energy” is it does not mean that the need for renewable energy automatically overrides environmental protection and the planning concerns of local communities. We have found planning authorities likely to approve sites if the visual impact is addressed by the choice of site and / or the use of well-planned screening. Some sites are screened by the lie of the load so that glint and glare, lights and fencing assume less importance. Where geography does not provide screening, screening with native ledges may serve instead. In one way or another visual impact may very well be (or can be reduced to) zero. Other things that may persuade the authorities to grant permission are continued agricultural use or the encouragement of biodiversity.There was much talk about a year ago of whether sheep could safely graze below the arrays but the subject appears to have assumed less importance most probably because of the importance of the potential rental income from solar use. At the end of the day, though, solar farms are usually temporary structures and, providing conditions can be used to make sure that installations are removed when no longer in use, the land can be restored to its previous use. It is usual to find planning consents limited in time. Temporary though the installations may be, certain income apparently guaranteed for 20 years or more may seem irresistible. But there are plenty of aspects to consider before signing up. Usually the arrangement is that the land owner is asked to grant the energy company an option to take a lease but the terms of the lease are to be agreed at the outset. Our analysis, usually undertaken with the owner’s agents begins by quickly measuring the paperwork against our checklist (assembled from experience over the last few years) to see whether the paperwork fits. We will then tailor it to the owner’s requirements.